Oh, E, E, dear letter E! Where have you been all my life? Eating and entertaining and eloping with all the other letters of the alphabet, making words and sentences…. Okay, so I’m getting little creative… and dramatic… You try writing descriptions for every letter of the alphabet several times over and you might go a little over the top, too! Anyway, I hope you enjoy using this things that begin with e worksheet. It has an elephant, egg, elf, eagle, ear and envelope on it. 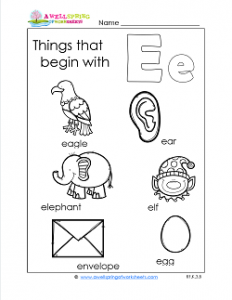 Read the words, circle the beginning e, and color … with flair and finesse!